Pyogenic arthritis, pyoderma gangrenosum, and acne (PAPA) syndrome is a rare autoinflammatory condition presenting with inflammatory joint and skin disease that is caused by autosomal dominant, gain-of-function mutations in PSTPIP1 (MIM #604416). PAPA syndrome was first described in a large family in 1997 (Lindor et al. 1997). The “streaky leukocyte syndrome” described in a teenage boy in 1975 was later confirmed by genetic testing to be a case of PAPA syndrome (Jacobs and Goetzl 1975). Familial PAPA syndrome is inherited in an autosomal dominant manner with phenotypic variability. De novo mutations are the cause of PAPA syndrome in other individuals. PAPA syndrome results from mutations in PSTPIP1 (proline-serine-threonine phosphatase-interacting protein 1), also known as CD2-binding protein 1 (CD2BP1), a tyrosine-phosphorylated protein involved in cytoskeletal organization. Endogenous PSTPIP1/CD2BP1 interacts with pyrin, the protein mutated in the clinically distinct autoinflammatory syndrome familial Mediterranean fever (FMF). Both PSTPIP1/CD2BP1 and pyrin are expressed in monocytes and granulocytes. The most common PSTPIP1 mutations seen in patients with PAPA syndrome, p.A230T and p.E250Q, markedly increase pyrin-PSTPIP1 binding, as assayed by immunoprecipitation (Shoham et al. 2003). 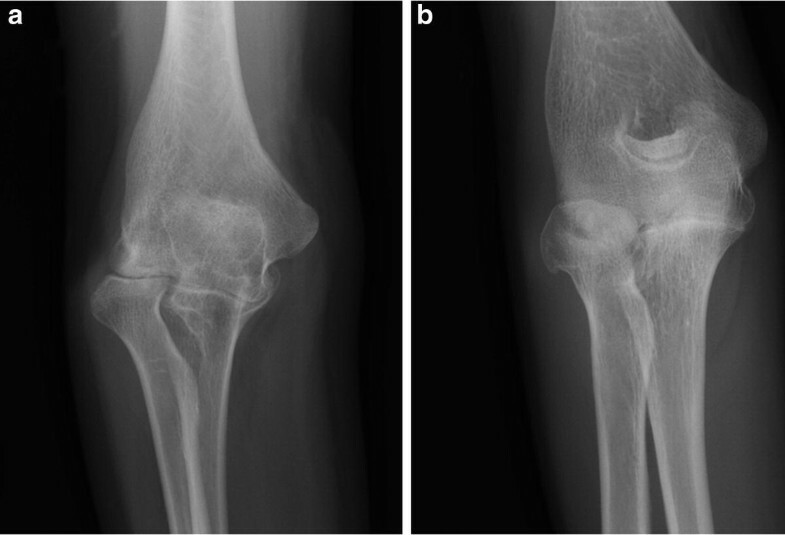 Individuals affected by PAPA syndrome frequently have recurrent episodes of sterile pyogenic arthritis that can result in joint destruction (Fig. 1). Seemingly trivial injury may trigger episodes of arthritis, and the same joint may be involved repeatedly. Osteolytic lesions may also cause bone pain in people with PAPA syndrome (Fig. 2). Pathergy in patients with PAPA syndrome may lead to the development of sterile skin abscesses at the sites of immunizations. Pyoderma gangrenosum (PG) lesions may develop spontaneously or after a minor skin injury or surgical procedure. 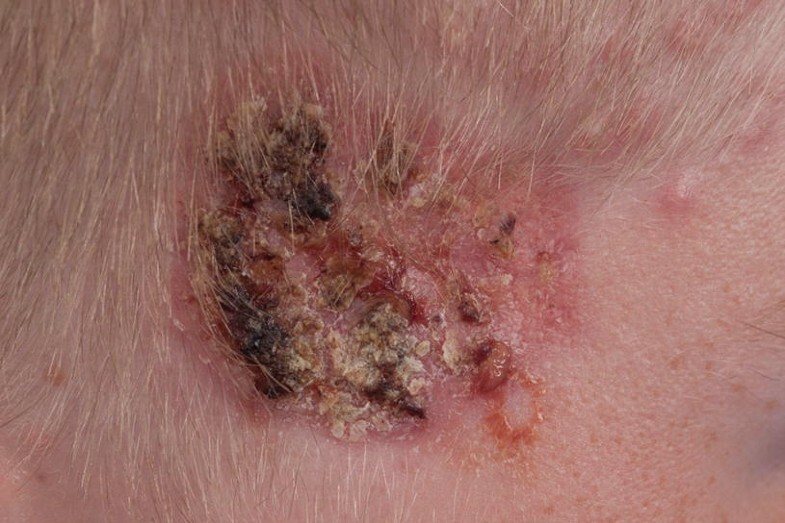 PG lesions are painful and scarring, and the involved areas are vulnerable to recurrence with expansion into the nearby skin (Figs. 3 and 4). Eventually large areas, such as the lower extremities or buttocks, may be involved. Large PG lesions and joint destruction from recurrent arthritis may cause difficulties with walking and the activities of daily living. After puberty begins, many people with PAPA syndrome develop severe, nodulocystic acne that is painful and scarring. PG lesions may also affect the face (Fig. 5). PG lesions may be misdiagnosed as cellulitis, with the resultant overuse of antibiotics. Individuals with certain mutations (p.E250K and p.E257K) in PSTPIP1 may have splenomegaly and pancytopenia in addition to the usual findings of PAPA. This syndrome has sometimes been denoted as PSTPIP1-associated myeloid-related proteinemia inflammatory (PAMI) syndrome (Holzinger and Roth 2016). At the time of disease flare, inflammatory markers (CRP and ESR) are elevated, sometimes markedly so. A complete blood count (CBC) may show a microcytic anemia because of poor iron absorption associated with chronic disease and inflammation. Sequencing of PSTPIP1 in patients with PAPA syndrome most frequently reveals mutations causing p.E250Q or p.A230T (Holzinger and Roth 2016). Sequencing has been found to be negative for PSTPIP1 mutations in some individuals with overlapping clinical findings, such as PG lesions and osteolytic lesions, indicating genetic heterogeneity. Autoantibody testing is usually negative. Treatment of PAPA syndrome can be challenging, as there is variability in clinical presentation and response to treatment (Omenetti et al. 2016). High doses of corticosteroids can suppress inflammation and help heal the lesions of PAPA syndrome. However, corticosteroids work only partially and temporarily and cause many side effects. Good wound care is critical to promote the healing of the skin lesions associated with PAPA syndrome. Inhibition of IL-1 with anakinra (a recombinant human IL-1 receptor antagonist) or canakinumab (a human anti-IL-1 beta monoclonal antibody) has prevented or ameliorated the arthritis associated with PAPA syndrome in some patients. Treating the skin manifestations of PAPA syndrome is often more difficult. Both IL-1 inhibitors and TNF inhibitors have helped heal the skin lesions of PAPA syndrome in some individuals, but neither works consistently. Canakinumab appears to have greater efficacy than anakinra, whether owing to better patient compliance or to a more consistent steady-state level of drug in the body. Some patients have benefited from concurrent treatment with inhibitors of IL-1 and TNF; however, individuals treated with more than one cytokine inhibitor, especially long-acting ones, should be monitored closely and treated promptly for concerns of infection. Anti-TNF monoclonal antibodies, particularly infliximab and golimumab, have shown greater efficacy than etanercept in promoting the healing of severe PG lesions. Severely affected patients may continue to require daily corticosteroids, and intravenous corticosteroids may be given to calm a flare of disease. Isotretinoin has improved the severe acne of PAPA syndrome when given with cytokine inhibitors and corticosteroids. Bone marrow transplant has helped at least one patient. Preventing the establishment of extensive areas of skin involvement and joint destruction with early diagnosis and aggressive treatment may prevent disability in individuals affected with PAPA syndrome. The diagnosis of PAPA should be considered in any patient with recurrent, sterile arthritis or PG lesions. Genetic testing for PSTPIP1 mutations is commercially available. While treatment remains challenging in some patients with severe disease, all have shown some improvement when treated with a combination of TNF inhibitors, IL-1 inhibitors, and corticosteroids.